It is cool outside and a little overcast which made me want my 2nd most missed food since leaving grains behind, hot cereal. I really liked oatmeal and I LOVED Red River cereal even more and this is a close imitation. I wanted it to have just a hint of sweetness so instead of maple syrup I decided to fry some banana in a little coconut oil. OMG! Why haven’t I been frying bananas all along? So awesome. Plus the texture adds to the consistency. I usually add a little almond milk but I didn’t today and I liked it even more. The berries were so sweet that I actually had to check them package to make sure they were unsweetened. They weren’t. The hemp hearts give it a nutty crunch and the chia seeds that glutinous texture. Food is such a personal thing, for me. I am really mindful when I eat. I have been for a long time and I think it was my Grandma who taught me that. She’s been gone for over 6 years now and I still miss her as much now as the day she died. She was a great lady who loved her family more than anything else in the world. And, her favourite way to show you how much she loved you was with food. “Eat, eat” she would always say and you would even though you were literally going to burst button on your pants. I loved cooking with her. She was an awesome baker too. Her donuts. Oh her donuts. She taught me a lot about life; love, laugh, be respectful and kind to others. But the most important lesson I ever learned from her: when you are cooking for someone, make sure you do it with love because they will taste it in their food. So I do. For them and for me. Because you have to love yourself in orde to love others. Have a great weekend everyone. I hope your plates are full of love and are nutritious and delicious. 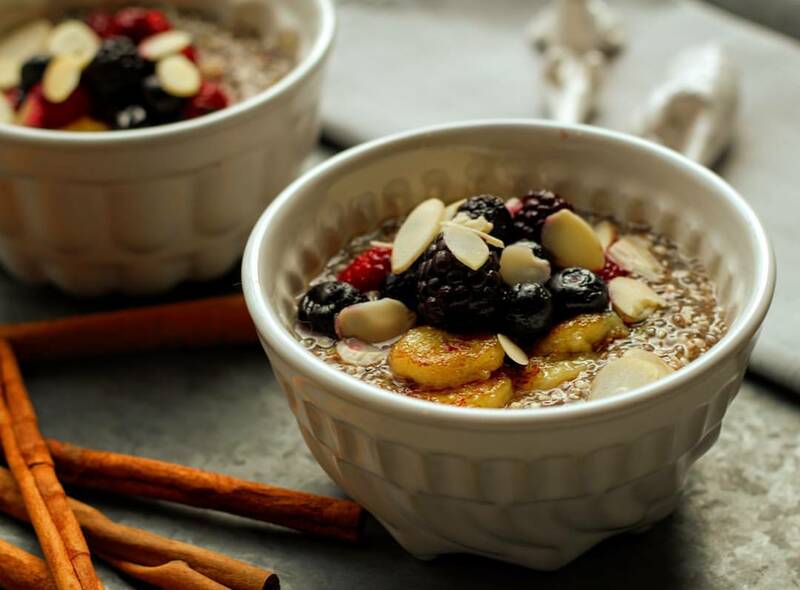 Mix chia seeds, hemp hearts, cinnamon and vanilla in a bowl. Let stand for 2 to 3 minutes. Add almond butter and top with fruit.